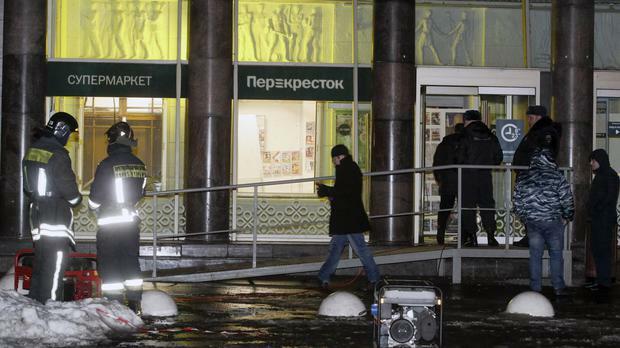 At least 10 people have been injured by an explosion at a supermarket in St. Petersburg, Russian officials say. The Investigative Committee, the nation's top investigative agency, said a device containing 200 grams of explosives went off at a storage area for customers' bags on Wednesday. No one has claimed responsibility for the explosion at a branch of the Perekrestok supermarket chain in the city's northwest Kalininsky district. Alexander Klaus, the chief of the local branch of the Investigative Committee, said 10 people were in hospital with injuries. "There was no panic, but people were reluctant to enter a nearby drug store and a grocery store," she said. Russian President Vladimir Putin telephoned US President Donald Trump earlier this month to thank him for a CIA tip that helped thwart a series of bombings in St. Petersburg earlier this month. The Federal Security Service, or FSB, said seven suspects linked to the Islamic State group were arrested in connection to the alleged plot. Andrey Kibitov, a spokesman for St Petersburg's governor, later tweeted that the injured were in satisfactory condition and one had been discharged from hospital. While officials stopped short of branding the explosion as a terror attack, the National Anti-Terrorism Committee that oversees anti-terror efforts in Russia said it was co-ordinating the search for suspects.